A tropical location in the Indian Ocean, Réunion Island is a French oasis with palm trees, sunny skies and a volcanic landscape. Réunion is a wonderful holiday destination for anyone looking for an escape, with more than 840,000 residents. Attractions include Kelonia Aquarium in Saint-Leu, Pas de Bellecombe in Saint-Denis and Piton de Fournaise volcano. Cheap flights to Réunion Island are now available for a limited period of time, so get ready to don your swimsuit and sunglasses! Réunion’s capital city, Saint-Denis, is home to Roland Garros Airport (RUN), which is a 15-minute drive from the city. The island boasts some stunning beaches for tanning and tropical beach days. Inland, the island boasts an array of adrenaline-pumping activities such as paragliding, abseiling, sky diving and canyoning. Warm French pastries, hearty African jollof rice, spicy Indian curries and sweet and sour Asian dishes, the food on Réunion Island is a culinary delight with delectable flavours from across the globe. For the adventure-seeker, hike through unchartered territory as you make your way through extinct volcanoes, alternating with lush greenery as you meet some extraordinary people along the way. 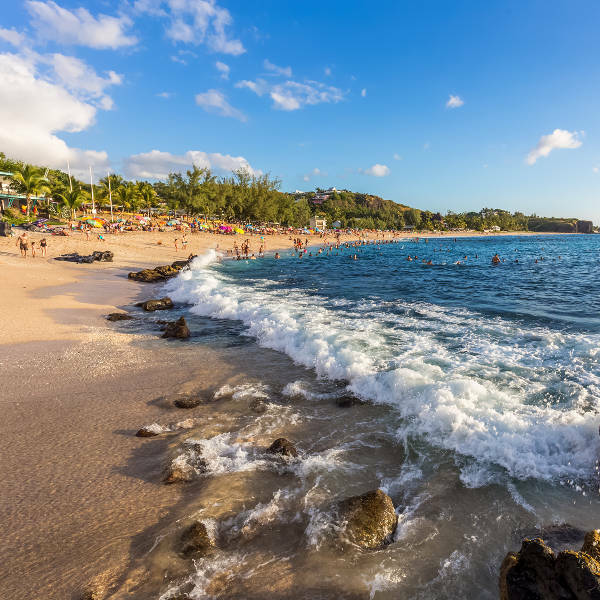 If you love swimming in warm ocean waters, then you’re in luck, as the temperature of the waters surrounding Réunion hardly ever drop to lower than 23°C. However, you may have to save your swimming and beach tanning until mid-March, as the island gets a lot of rain from December to March and experiences occasional cyclones. It is also very humid during this time. Also, please be aware that there are sharks in the water and people are only allowed to swim in demarcated swimming areas. Ideally, the best time to visit would be between April and September, with June being the most quiet time to visit. Though tropically warm all year on the coast, it gets chilly up in the mountainous areas so visitors are advised to take along the appropriate clothing. A stunning holiday destination, Réunion Island has something for everyone to enjoy. Whether it be beach, adventure or cuisine, you’ll be sure to find it here. One of the island’s main attractions would most definitely be the Piton de Fournaise volcano. This is one of the most active volcanoes in the world, constantly monitored by officials as the lava flows directly in the ocean waters. To see the full, fierce force of the volcano, you can hike, drive, or even take a helicopter ride for an aerial view. 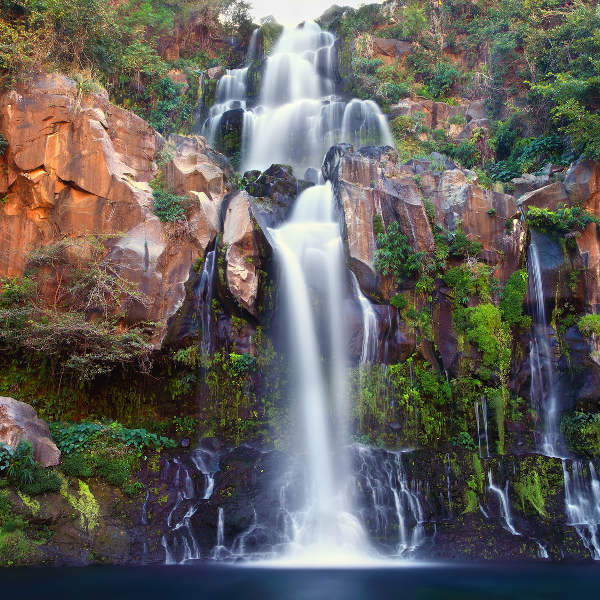 The island has more than 1000kms of hiking trails, so whether you’re hiking up to Piton de Fournaise, or anywhere else, you’ve got plenty of options with valleys, cliffs and even stunning waterfalls. Visit the Cascade Blanche, an 800m waterfall in all its glory, just one of more than 100 waterfalls across the island. For a bit of fun, head to the student district city of Saint-Paul. Here you’ll find trendy nightclubs and bars, and you can dance the night away. And for those looking to work on their tan and get those postcard beach images, visit the sandy shores of Saint-Giles. The food in Réunion is exceptional as the island is home to a large array of cultures and religions. 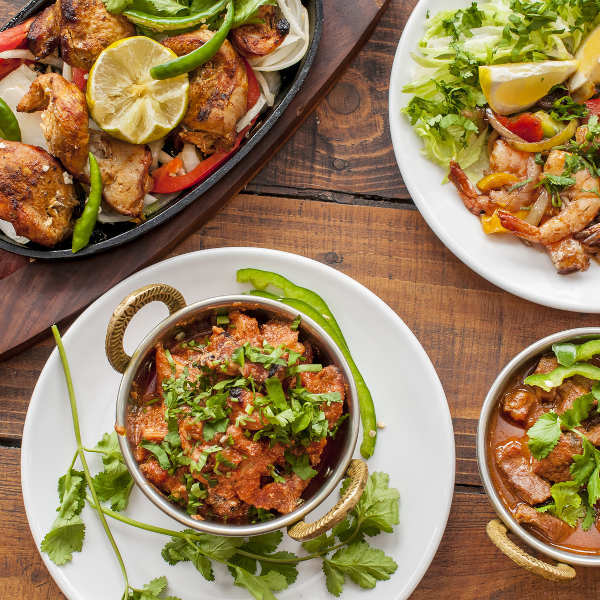 Whatever your fancy, you’re bound to find some culinary masterpieces with influences from the French, Chinese, African and Indian nationalities. To accompany this, Réunion has plenty of rum too, with their own locally-crafted version named Rhum. Compare several airlines, and book your cheap flights to Réunion Island online with Travelstart! Réunion is a very safe island, but as with most popular holiday destination, petty crime can be a problem. To keep yourself and your belongings safe, make a habit of leaving your valuables in the hotel safe, don’t walk around with large amounts of cash, and avoid walking around alone after dark. In occurrences of heavy fog, make sure to stick to well-marked paths and wear thin, but warm layers. You should also ONLY swim in demarcated swimming areas, as there are plenty of sharks around, who are kept at bay with protective nets. It is always important to have your vaccines up to date when you are travelling. When visiting Réunion Island, it is recommended to get a vaccination for hepatitis A, as you will most likely be eating food that is unfamiliar. You should also get a shot for typhoid if you’ll be doing any trips to smaller, more rural areas of the country. Other vaccines that are recommended are hepatitis B, yellow fever, malaria and rabies.